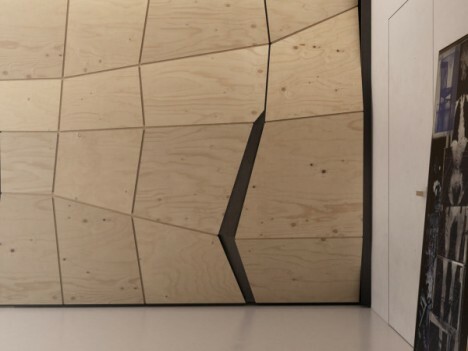 Long considered a sub-material that should always be covered with something else, plywood has come into its own as a visually striking surface option for interior applications. 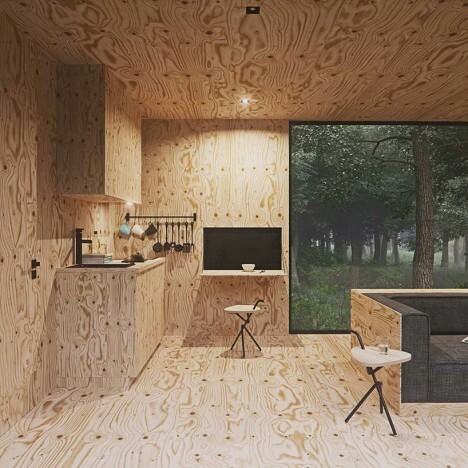 An affordable alternative to solid wood, plywood is easy to shape, readily available and comes in textures ranging from the smoothest birch panels to mottled pressboard, and it’s getting a starring role in everything from micro apartments to cafes and modern offices. 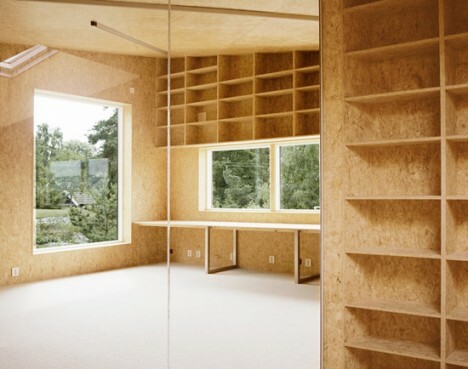 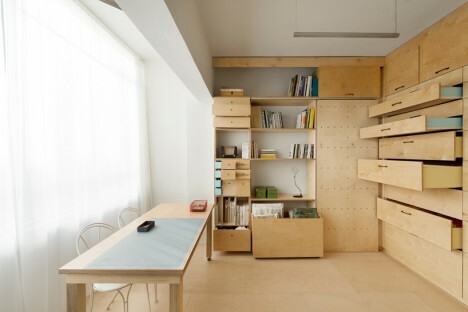 Thin sheets of beautiful birch plywood make up a clever floor-to-ceiling arrangement of drawers, doors, cupboards and niches in this multifunctional artist studio by Ranaan Stern. 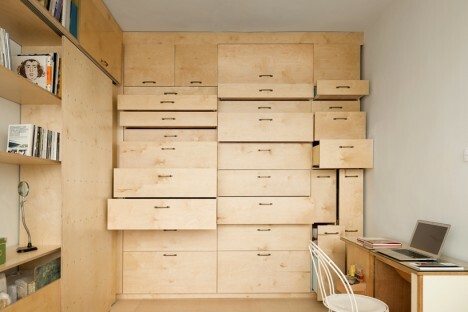 The drawers are custom-sized to fit a collection of two-dimensional art pieces. 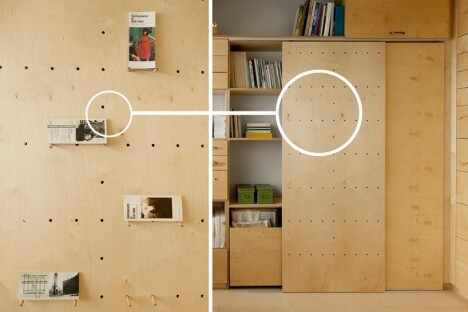 The sliding door hides a folding bed, and features peg holes for displaying smaller works of art and hanging tools. 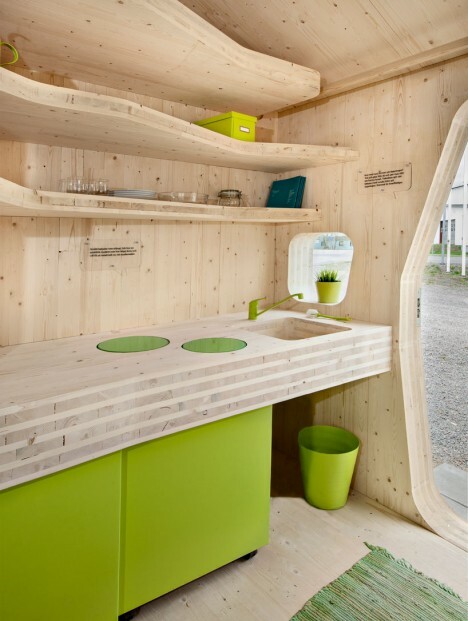 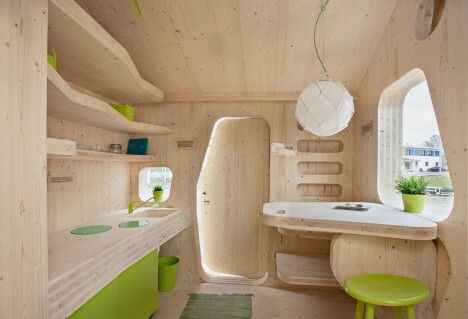 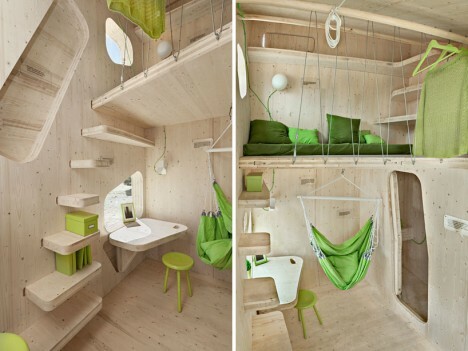 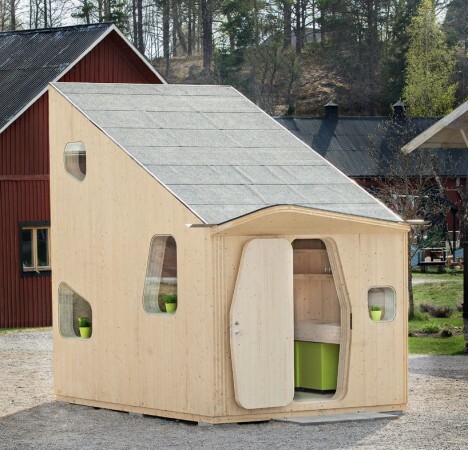 Created in response to a need for affordable student housing, this environmentally friendly ‘smart student unit’ is made from cross-laminated plywood and packs a surprising amount of comfort and function into under 100 square feet, including a kitchen, fold-down table, hammock, stairs leading to a sleeping loft, and even a private bathroom. 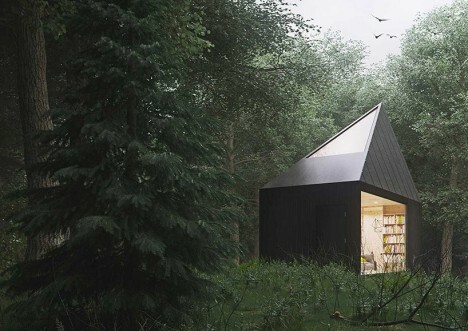 A striking, matte-black geometric cabin in the woods of Poland by Tomek Michalski looks dark and monolithic from the outside, but bright and cheerful inside. 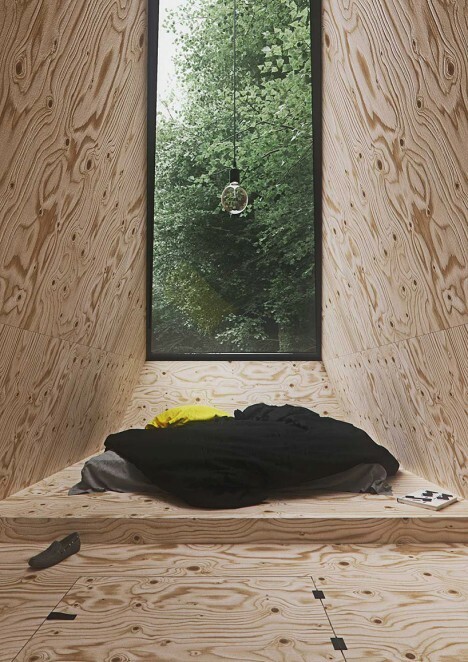 The designer used plywood for nearly all interior surfaces and built-ins, including the couch and bed platform. 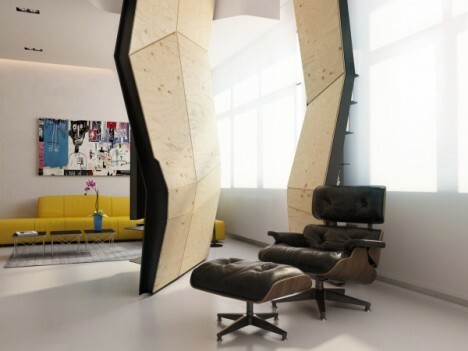 This faceted geometric wall pushes out into the space within a 645-square-foot apartment by Vlad Mishin. 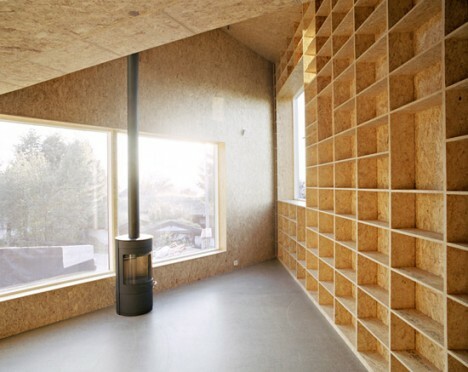 Behind those plywood panels are books, a television, a kitchen and doors to the bathroom and bedroom. 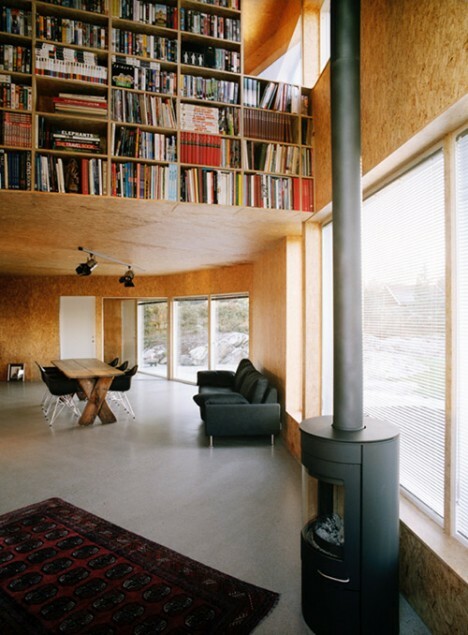 Raw plywood pressboard covers nearly all of the interior surfaces in Norway’s ‘Triangle House,’ from the stair treads to entire walls of floor-to-ceiling shelves.